Helicopter Ben testified before both houses of Congress today and that the recession might end this year. It appears that these comments sent the stock market up over three percent. Citigroup, which has been circling the drain over fears that the bank would require nationalization that would wipe out share holder value gained over 21% because Ben said that the US Government would not need to take such action. Gold fell to around $950 an ounce and, most mystifying of all to me, Barrick Gold (ticker symbol=ABX) and fell over 11%. Wow. That must have been some speech. It’s hard for me to imagine Barrick falling 11% because Ben said the recession “might” end in 2009. After all, even at $950, gold is still close to its all time high. I guess people were figuring that, if the recession ends, gold will no longer be in demand. Therefore, the price of gold should fall, and Barrick will not make as much money. Here’s the thing they are missing. Helicopter Ben has been forcing money into the economy at every opportunity. 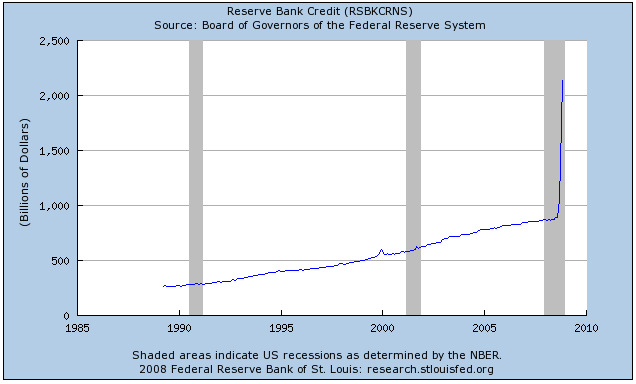 Here’s a graph of the increase in “Reserve Bank Credit” by the Federal Reserve Bank of St. Louis. Inflationary expectations for the market at large have remained rather sanguine. Of course, I feel that this means inflation is coming and nothing is going to stop it based on the simple argument that the more money there is the less each unit of money is worth. Other people see things differently. They are that money’s “velocity” will slow down. You see, they feel that it’s not just the amount of money in circulation that matters, but how fast it circulates. So they argue that yes, the raw amount of money in the economy has gone up, the velocity at which it is circulating has gone down because of the recession. Therefore, the amount of money circulating throughout the economy is close to unchanged. Fair enough. I don’t know that I really believe in this theory, but I suppose it may have some predictive power. But, if it’s right, then that means that there’s a great deal of inflation just around the corner. You see, the velocity of money is, according to theory, slow right now, but it will speed up if the recession ends. Since the amount of credit extended to banks has been hugely increased in the meantime, a return to the old velocity level should bring about considerable inflation. That would be good for gold. Hence, the idea that the recession is ending is not really bad for gold, so Barrick should not have been down like it was. Oh well. I never said the market was rational. Roger, a commenter of this blog, has recently made the argument that we won’t see inflation because the deflationary pressures of the trillions of dollars in derivative loses will knock so large a hole in bank balance sheets that they will be unable to lend. A interesting theory. I’ll speak to its merits in another post. What I’ll say for now is that if that’s right, then Ben is wrong. Banks will have to be continually bailed out if not nationalized. The recession will not end this year. If Ben is right about the recession ending (which he’s not), then inflation is going to come back in a big way because of all the money he’s been pouring into the economy. If he’s wrong, then gold will continue to be a safe haven as the American economy and the US Dollar undergoes more and more tampering. Either way, gold is a buy. Fortunately, I was just on my way to purchase some more gold. This drop in price will allow me to buy even more. I’d encourage my readers to do the same.